Good morning! What’s so good about it you ask? Well, the sun is shining through the smog of my city, I’m looking forward to dinner in my favorite French restaurant with my favorite lady (my mom! ), and I’m having cuajada for breakfast. Cuajada is a creamy milk curd from Northern Spain, although you can have it all over Spain now. I have mentioned cuajada before here and here. 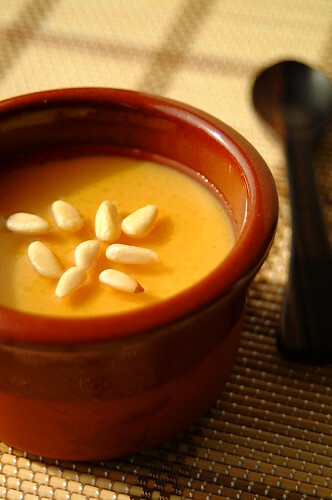 It is traditionally made with sheep’s milk (leche de oveja), but is now often made with cow’s milk. The cuajo or rennet is added to the heated milk and this is what curdles it. Rennet is a natural complex of enzymes found in the cow’s tummy (actually any mammalian tummy), and what digests mother’s milk. This complex contains an enzyme which coagulates the milk, making it separate into curds and whey. Now, if mammalian tummy (present company’s excluded) is not readily available to you, rennet is also available in tablet or powder form. If you are at a restaurant that makes their own cuajada or serves fresh, please, take it! Take two and think of me! Also, grocery shelves throughout Spain are filled with commercially made cuajada, some better than others – look out for the ones in the clay pots marked “de leche de oveja”, these are the best. And if that still eludes you (like, for example, if you live half a world away), there is the last resort, which I have used here – cuajada mix. This is nowhere near as good as fresh cuajada, but as fresh cuajada in Manila is, for now, a lovely fantasy, it will have to do for me. When I saw these on the shelves in El Corte Ingles, I purchased a bunch to send home. I have made them here in the clay crocks I bought in La Bisbal, along the Costa Brava. This is my favorite way to have it…with honey and pine nuts. It’s usually served as dessert, although sometimes also for breakfast. I can have it both times, and a third for snacking! Simply put, I love cuajada. To bits. No visit to Spain is complete without it. I think of it the way other people think about eating paella in Spain. Not leaving until I’ve had my fill. Is it that good? Obviously, opinions differ. This is, after all, a simple milk curd, taken with honey, sometimes nuts, sometimes fruit. But there is something about its creamy smoothness, its milky white innocence, which makes me feel inexplicably optimistic about life. – Add a vanilla bean or a cinnamon stick to the milk when heating. – Try experimenting with other spices and flavors…could a “chai cuajada” be in my future? – Use carabao’s milk! Extra creamy! I doubt this is still active after 4 years but here goes. I'm seeking directions on how to create this delicate dessert at home. I live in Ohio and have occasional access to fresh goat's milk. I took a trip to Spain last year, at about this time, to walk the Camino de Santiago. We started at Roncesvalles and the night before we started our pilgrimage we were treated to this simple, delicious dish following our meal of lamb and vegetables. It was served with honey on top and it was absolutely divine. Do you have a recipe? If you do, I would deeply appreciate it if you shared it with me. You can reach me via email. Thank you very much. I just came back from La Rioja and ate cuajada morning noon and night. And now I am back in the USA completely going into convulsions because there's nowhere to get this wonderful concoction.